You know, I’m just not a big fan of raisins. By themselves, they’re okay, not too offensive. But in baked goods? Yuck! I hate biting into a slice of bread or an oatmeal cookie and being confronted with the chewy sweet blandness that is the raisin. I do occasionally like dried cherries or craisins in baked goods, but I just have this thing with the raisins. 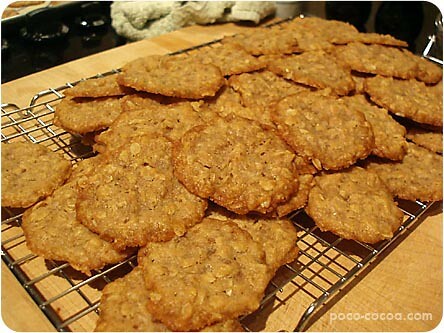 So I’m always happy to find an oatmeal cookie that tastes just dandy without them. This one fits the bill, chewy and crisp, with a bit of lovely coconut to add some dimension and flavor. I took them to work today in celebration of the promotions of two of my coworkers (hooray for them! ), and the plate was empty before lunch. Pretty popular little cookies. Random fun link: Orangette, for absolutely lovely food writing. Molly makes food seem happy and lively and fun. In a small bowl, combine the flour, baking soda, cinnamon and salt. Set aside. In a large bowl, cream the butter with the sugars until smooth, about 2 minutes. Add the egg and vanilla, and beat well. Add the dry ingredients and mix thoroughly. Stir in the oats and coconut. Drop by rounded teaspoonfuls onto ungreased baking sheets, leaving several inches between for expansion. Bake for 11 to 12 minutes, or until lightly golden. Cool the cookies on the sheets for 5 minutes, and then remove to a wire rack to cool completely. You’re back, that’s so nice!! !